Year to date our model portfolio has returned 9.8% return versus the S&P 500 Average’s 16.0%. Baring unexpected favorable news this week we will fail to outperform the S&P 500 Market average for the second time in the nine years we have published this newsletter. Our cumulative return over this same time frame is a much more favorable 279% versus the S&P 500′s 54%. 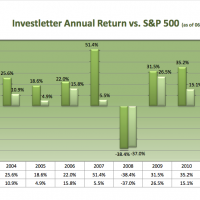 While we have only published the newsletter the past nine years, the same strategy has beaten the S&P 500 average eleven out of the past thirteen years and returned a cumulative 456% matched against a 24% return on an investment in the S&P 500. Take a look at the chart to see year by year performance numbers.